Secret expedition by the Museum to Peru in 1985. A Chancay girl by the name of Ollantay/Cusi Coyllur had been kidnapped by the Incas and groomed to become a princess. In a desperate state because she could no longer see her beloved, her childhood friend to whom she had given her heart, she let herself perish from grief and was buried in a mountain cave. Some years later, her betrothed - who in the meantime had become a powerful brujo or 'shaman' - went to visit her tomb, as was his custom. That evening, the wind blowing through the bones of his beloved created an unbelievably sinister plaintive wailing. Seizing the femur of his lady-love, he carved out a quena, a type of flute, on which he played such appallingly sinister music that the spirits yielded to his will. 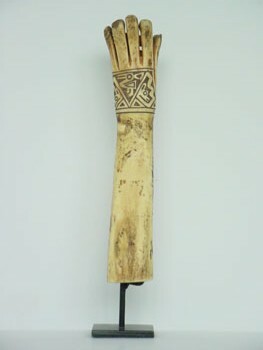 The Spaniards would later call it the 'flute of terror', the C'anterro. That evening, he used all of his powers to invoke the white god, Viracocha, by calling for vengeance against the Incas whom he hated so much. He offered Viracocha the quena. The god, moved by his petition, promised him that if one of his descendants ever found the flute hidden in a secret place in the Andes, and carried out the appropriate rite and sacrifices, then he would have his revenge. 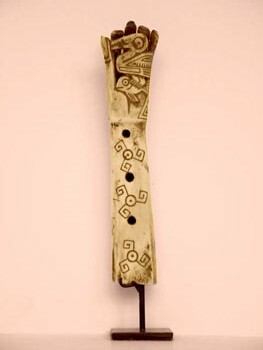 A few centuries later, in early 1530, one of the great-grandchildren of the brujo found the bone flute and played it. That very same year, the Spanish conquistador Francesco Pizarro landed at Tumbes, in northern Peru, leading 183 adventurers and driving 37 horses. He subjugated the Inca Atahualpa on 16 November 1532, had him executed a short time later and went on to annihilate the Inca empire on his own. Just as Cortés had done to the Aztecs in Mexico. The white god had a strange look about him. In Peru, the legend gave rise to a well-known play featuring General Ollantay and Princess Cusi Coyllur, a kind of Inca Romeo and Juliette, under the reign of Tupac Yupanqui (1463-1493). Other accounts supplement the story, all of which mention the baleful aspect of the flute: such as a monk who went mad and disquieting supernatural apparitions. In 1985, a tomb raider with a 16th century map contacted the Investigation Team at the Surnateum. He offered to co-finance an expedition and offered to let the Surnateum keep the flute while he would keep the rest of the treasure associated with Princess Chancay Ollantay. We agreed to his terms, despite our custom of leaving cursed objects quietly concealed in their sanctuaries, because otherwise the flute could have fallen into the wrong hands. Indeed, the map was no longer a secret since the tomb raider had approached other associates with the same proposition. In that case, the excavation proceeded without incident - something that we cannot always count on. Our only 'booty' from the expedition were the quena and a piece of cloth from the mummy found in the relic's final hiding-place. It is still perfectly playable. We recently found the invocatory music and the appropriate ritual for reactivating the dormant power within this item. Now we just need to find a flautist - but there is no shortage of flautists from the Andes busking in the streets of Brussels. The relic is scheduled to be reactivated shortly.